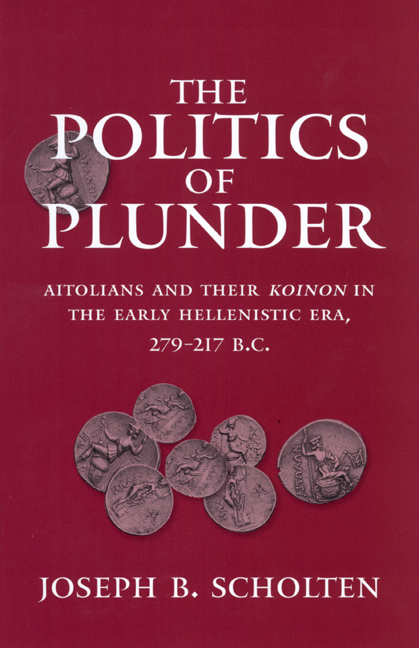 The Politics of Plunder Aitolians and their Koinon in the Early Hellenistic Era, 279-217 B.C. Between 279 and 229 B.C., the Aitolian koinon, a federation of mountain cantons in west central Greece, expanded to incorporate many of the neighboring lands and peoples lying between the Adriatic and Aegean Seas. This new political configuration contributed to the development of modern systems of federal democracy based on proportional representation. Despite these institutional advances, the Aitolians and their polity are reviled in the ancient historical tradition, which views them as backward, semi-barbarous brigands. 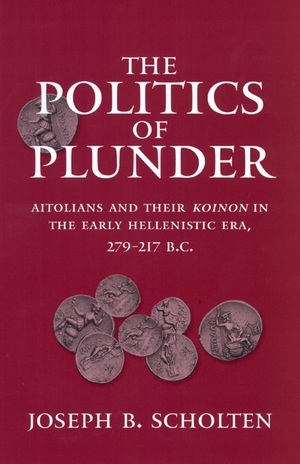 The Politics of Plunder is the first English-language book in over a century to examine the political history of the Aitolian koinon in its era of expansion. Joseph Scholten presents a chronological reconstruction of the koinon's course of expansion, synthesizing a number of recent studies covering Aitolian topography, epigraphy, and institutional development that help to compensate for deficiencies in the ancient narrative record. His study is the first to ask how a people and a polity so detested by their contemporaries succeeded in making such fundamental contributions to their regional political culture. Scholten's careful investigation charts a middle course that neither whitewashes the Aitolians nor credulously accepts the biased ancient tradition. This balanced approach provides a much-needed fresh perspective on the Aitolians and their koinon. Discussing the history of the ancient Aegean Greek world and the political, economic, and social history of the Hellenistic Era, this book will interest anyone concerned with those subjects or fascinated by the development of ancient Greek political institutions and theories, particularly federalism. Joseph B. Scholten is Associate Professor of History at Michigan State University.